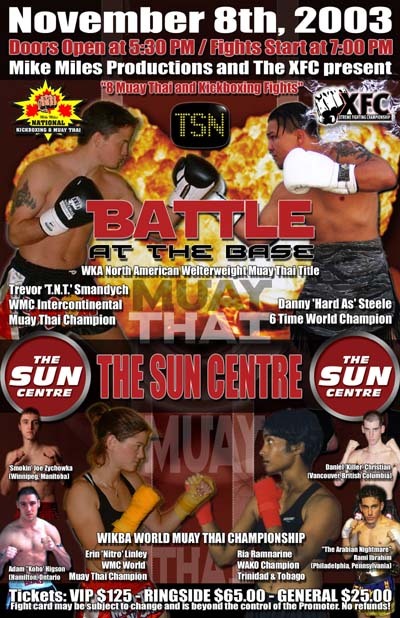 In 5 1/2 weeks, Mike Miles Productions and the XFC present the upcoming TSN (Canada's national sports television network) fight event, 'Battle at the Base' on Saturday November 8th, 2003 in Calgary, Alberta, Canada. The event will be taking place at The SUN CENTRE which is Calgary's newest sports and entertainment complex (quickly establishing itself as 'the' fight venue in Calgary). The event will feature 8 bouts to be cut into 4 upcoming shows on television as well as pay-per-view. The card will feature a co-main event. The first main event featuring Calgary's Trevor 'T.N.T.' Smandych (3 Time WMC Intercontinental Muay Thai Champion) stepping into the ring against 6 time World Champion Danny 'Hard As' Steele (USA). The bout will be at 147 lbs. maximum. This is seen as a big step up for Smandych. The match will be fought under modified Muay Thai rules (no elbow attacks and no knee attacks to the head). Steele is a well respected and very dangerous champion. The co main event featuring Calgary's Erin Linley (WMC World Muay Thai Champion) stepping in the ring against Trinidad's Ria Ramnarine for the vacant WIKBA (Women's International Kick Boxing Association) 110 lb. World Muay Thai Title. This bout will also be fought under modified rules not allowing elbow attacks or knee attacks to the head. Dave Zychowka (Manitoba, Canada) takes on Adam Higson (Ontario, Canada) in a 5 round non-title modified Muay Thai rules bout at 159 lbs. maximum. These gentlemen have ben eye-balling each other for a bout for quite some time. This will be a war. Daniel Christian (British Columbia, Canada) steps into the ring against the very popular east coast American athlete Rami Ibrahim (New York, USA) at 140 lbs. maximum. The bout will be a full Muay Thai rules bout with padded elbows. Rayelene Kellock (Alberta, Canada) steps into the ring against American Natalie Fuz (New York, USA) at the 147 lb. weight division. This bout will also be fought under full Muay Thai rules with the use of elbow pads. Three other bouts are still unsigned and in the works for this fight event. This event WILL be totally sold out!